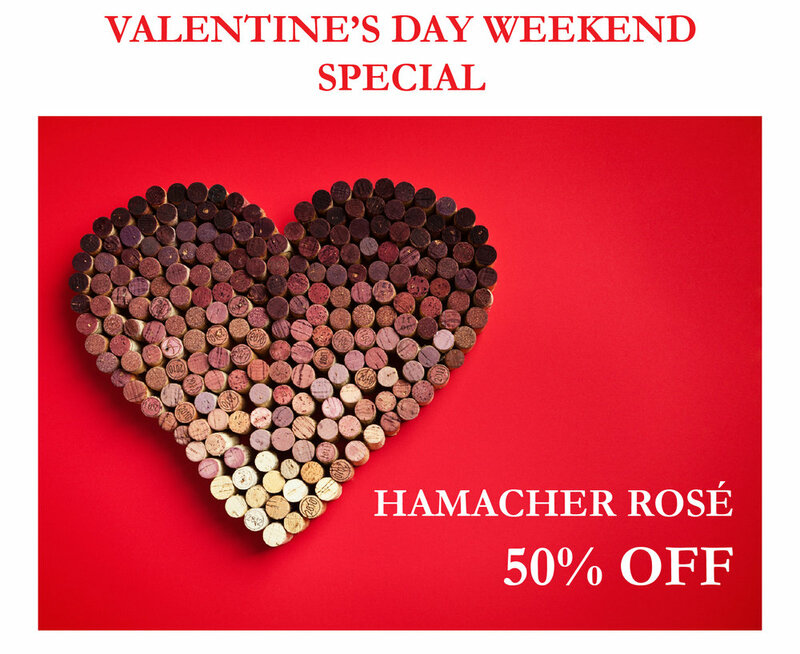 Experience the best of Hamacher Wines during this exciting weekend! Members, enjoy the convenience of choosing your pick up day festivities to sample our spring releases. On Saturday, meet the winemaker and enjoy passed appetizers catered by the South Store Café. On Sunday, chat with our staff with and enjoy a complimentary charcuterie provided by our Hamacher Wines team. Help us kick off the season with an extended flight, beautiful weather and light bites. Get to know our staff, learn about the wine club, participate in our interactive lawn games and have fun discovering the winery grounds. Don’t forget to bring a picnic to enjoy on the patio. Kids and families are welcome! Eric Hamacher and Adam Campbell of Elk Cove Vineyards are hosting a once-in-a-lifetime, all-inclusive 4-Night/3-Day event of sport fishing, gourmet meals and two hosted winemaker dinners! Click here to purchase tickets. See below for more information. SIP & LOUNGE WITH ART - LOCALS’ NIGHT! 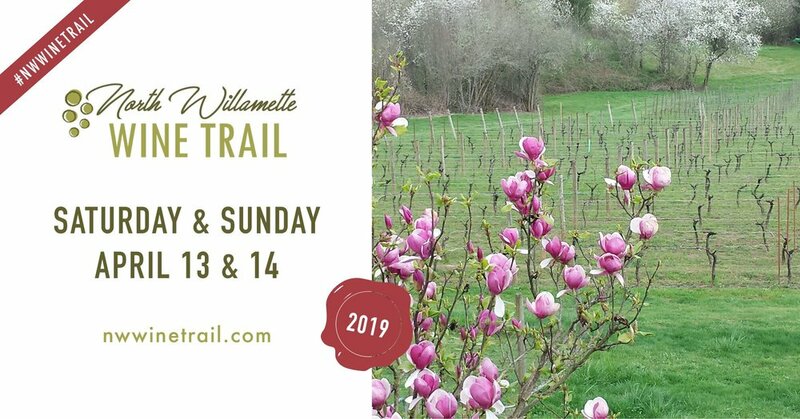 We're joining up with eleven esteemed wineries and other local businesses in our neighborhood for a weekend of special events, wine tastings and pairings. Collect stamps from four participating wineries & local businesses for a chance to win a Wine Lovers Package that includes gift items from each winery and local business. Two winners will be selected. Please note that some activities will be held on specific days. See below for details. Ardiri Winery & Vineyards: Wine, Rosé S’mores, Pink Tractors, Handbags & Jewelry – the perfect indulgences for Valentine’s Weekend! Be among the first to try Ardiri’s 2018 Pink Tractor Rosé (available this weekend only), paired with S’mores made with Rosé marshmallows. Find the perfect gift in our boutique of handcrafted jewelry and leather handbags from Dana Karin Jewelry & Mari Lassa. Be sure to snap a shot on our Pink Tractor, which will be showcased at the tasting room for this special event. $15 tasting fee, complimentary for Wine Club Members. A Blooming Hill Vineyard: Wine, chocolate, music and more… all part of a flight of romantic reds and sultry whites. Taste our Riesling and Rose – perfect symbols of Valentine’s Day – along with all of our whites and Pinot Noirs. Indulge in our two Chocolate Fountains and make an ice cream sundae with our Pinot Noir ice cream! Music by Ron Sabin. Souvenir photos provided! $10 tasting fee; waived with 3 bottle purchase. Always complimentary tastings for wine club members. Alloro Vineyard: Join us for a special flight showcasing side-by-side vintages of ‘Riservata’ Pinot Noir! Producing just 12 barrels each vintage, this wine is Estate grown and a special barrel select blend, crafted to capture additional weight, body, texture, and complexity while showcasing our Estate’s distinctive personality. And take home a beautiful rose for your Love! $20/person – waived w/three bottle purchase. Complimentary for Members. Blakeslee Vineyard Estate: Bring your sweetheart up to Blakeslee to warm their heart, enjoy a nice wood fire in our new Piazza and complimentary sweet treats – Sheila’s FAMOUS sea salt and chocolate chip cookies! Tasting flight $20, which includes our award-winning Rosé of Pinot Noir garnished with berries. Look for our surprise select magnum sale. Blizzard Wines: Our special Valentine’s Wine Flight will have you Moonstruck! Be among the first to taste our newly released Rosé, alongside Big Reds from Columbia Valley, all decadently paired with Moonstruck Chocolate Truffles. $15 tasting flight, complimentary for Club Members. Seated tasting of Champagne & Blizzard Wines w/ food pairings available by reservation, see website for details and to book a spot. 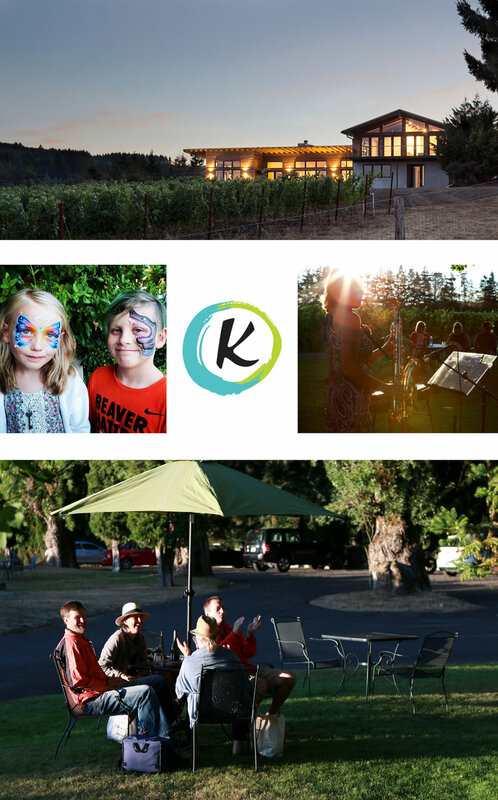 Cooper Mountain Vineyards: Cooper Mountain Vineyards invites you to celebrate love with us. Join us for a fun and engaging Valentine’s flight of four wines, featuring single vineyard Pinot Noir paired with chocolate bites. The experience isn’t complete until you finish with a little Apicio, a 15-year barrel aged balsamic vinegar made with the grapes from the Cooper Mountain Estate. Flight fee $30 per couple; $20 per person. Tasting Fee is waived per couple upon $100 spent in wine. Complimentary tastings for Wine Club Members. Dion Vineyards: We’re always happy to reopen for a special weekend in February and we love to see folks! We are thrilled to have the very talented and ‘magical fingers’ masseuse of Jen Jane hosted in the barrel room this year for the Valentine’s Wine Loop. Come spend it with a truly rewarding love: Pinot Noir … and massage! We will be celebrating love and joy and self-care — Jen will be onsite Sat-Sun and chair massages are available for 5-min neck or hand massages for only $10! We’ll be pouring a 5-wine tasting of Sparkling Wine, Chardonnay, Pinot Noir, Reserve, and Tempranillo for $15, add on a massage for only $10 and treat yourself or your love! Complimentary tastings for Wine Club Members. Hamacher Wines: Food, wine, romance and trivia? Please join us Valentine’s Day Weekend and enjoy a glass of Hamacher Pinot Noir paired with 3 festive food selections to complement its robust palate. The glass pour and pairing include a Valentine’s Day-themed trivia quiz to partake in with a chance to win a bottle of your choice from Hamacher’s classic line-up. Tickets available to purchase online or in the tasting room. $25 and $20 for Hamacher wine club members. Pairing fee waived with 6 or more bottles purchased. Membership discounts apply. Standard tasting flight will still be offered during the weekend. Hawks View Winery: Gather at Hawks View Winery for a Valentine’s Weekend Event! Enjoy stellar views of Mt. Hood from our new deck and a flight of your favorite Hawks View Pinot Noir and Pinot Gris, featuring new releases. Tasting flights are $20 per guest and, as always, complimentary for Wine Club Members. Artisanal cheese and charcuterie boards available for purchase. Cheers! Oak Knoll Winery: Join Oak Knoll Winery for a blind tasting with chocolate. Tasting fee is $5/person. Complimentary tasting for Oak Knoll Club Members. Raptor Ridge Winery: Join us on Valentine’s weekend and create your own custom bouquet. Sip on some Raptor Ridge bubbly, enjoy a special tasting flight and select from an array of traditional blooms and eclectic foraged greenery. Our talented floral designer will create a unique arrangement for your special someone. $25 for 8 roses or a mix, $20 tasting fee, complimentary for Wine Club Members. Ruby Vineyard & Winery: Stop by Ruby for the full Valentine’s Day romantic package! Friday-Sunday, Flowers by Burkhardt’s will be offering an array of single flowers and bouquets, and we will be offering a special tasting flight including our rarely opened 2016 Sweet Sammy. We will also be tasting through some of our most prized Pinot Noirs, and offering a special deal on our “Pet-Nat” sparkling Chardonnay. $20 tasting fee; complimentary for Wine Club Members. Looking for another fun stop or lunch spot? Stoneberg Alpacas Farm and Boutique: From Farm to Boutique, we have a variety of items for you to delight in. when you step into the boutique, you will find some of the finest in alpaca wear: from socks to scarves to sweaters and more. We even have bags of grain to purchase to give you an up close alpaca experience. So swing on by to find your loved one a beautiful and cozy way to make Valentines a bit warmer. Cruise In Country Diner: Grab a grass-fed burger, homemade fries, salad & shake at this local favorite, which has the classic feel of a 1950s-style diner with classic car decor. Midway Firehouse Pizza: A new local favorite, Midway Pizza is a perfect mid-point for a lunch or dinner stop during your Valentine’s Wine Loop ventures. This family run pizza restaurant specializes in gourmet pizzas with a variety of other menu items including appetizers, panini’s and salads. Our 2019 Events Calendar is coming this winter, but be sure to join us next month for our Valentine’s Day Weekend Food & Wine Pairing on February 9th & 10th. See below for more information. 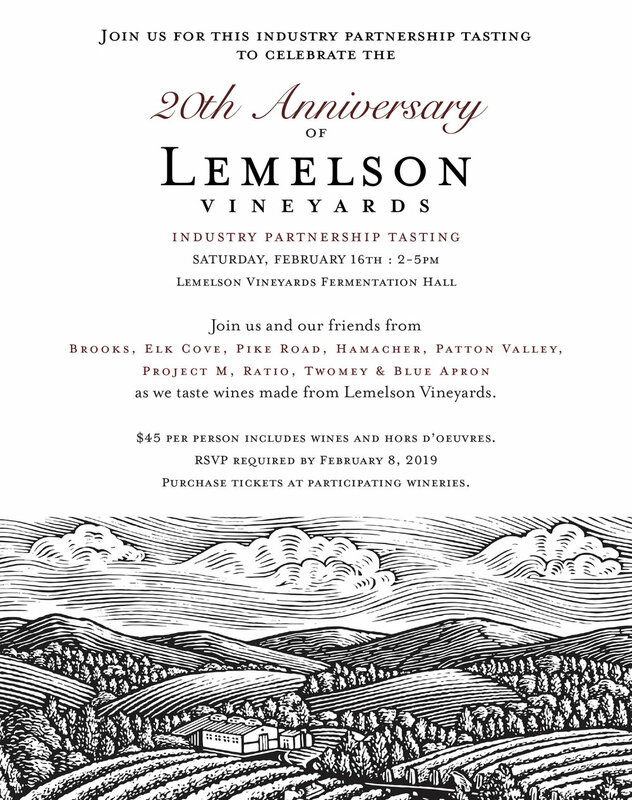 On February 16th we’re collaborating with our friends from Brooks, Elk Cove, Pike Road, Patton Valley, Project M, Ratio, Twomey & Blue Apron to celebrate Lemelson Vineyards’ 20th anniversary in the valley. Come learn about Eric Hamacher’s groundbreaking work and winemaking adventures back in the day, while enjoying a variety of world-class wines from the industry’s finest. Hors d’oeuvers will be provided. See below for more information. Ticket sales close on Friday, February 8, 2019. With your collaboration, we collected almost 100 lbs in food in November and December for the Oregon Food Bank, which is more than twice the amount we did last year. Nice work! Hamacher Wines is proud to help aid their efforts in ending hunger in Oregon, but we couldn’t of done without your help. Thank you! For more information, to donate or to find out how to get involved with the Oregon Food Bank, click here. Stay tuned for additional opportunities with Hamacher Wines to give back to the community. In collaboration with our industry partners and with the Oregon Food Bank, we are pleased to offer 15% off any Hamacher bottle purchase when you donate five or more non-perishable food items during the months of November and December. Members receive 25%. Extra donations are encouraged and welcome, but incentives are redeemable one-time-only. Visit us this holiday season and drop off your donations. For more information on the Willamette Cares Food Share program, click here. The dust always settles after Harvest and the activity level slows to a crawl in both the winery and the vineyards through the end of the year. Thankfully 2018 has show pretty nice weather bus far, so that the start of pruning in January was easy compared to the snow and ice of 2017. As we enter February, we are starting to pull together the “early to bottle” wines from the 2017 Harvest. The first several weeks of the month will see racking and blending of the various tanks and barrels of Rosé and Riesling followed quickly with their bottling at the end of the month. They taste so good and promise that spring is not too far away! Expect to see the Rosé in the Tasting Room soon! It's hard to believe that we have already begun the work of the 2018 Vintage. Thank you for subscribing to the Hamacher Wines Newsletter! Stay tuned for announcements regarding our new releases, wine club and tasting room events! We do not sell or share your information and you may opt-out at any time.